tree in his backyard. One branch formed a horizontal fork, which was perfect for him to lie on facedown and read, think, or just be alone. His parents had no idea that this was his hiding place. There he was…The branches swept up and down, like huge waves on an ocean—and Daddy saw me, and right away he came out into the wind and the weather, and I felt so relieved because I just took it for granted that he would climb right up the tree to get me. But that wasn’t his plan at all. But the wind and the rain slapped that cherry tree, bent it back and cracked my limb at the trunk. I dropped a foot. My eyes flew open. Then the wood whined and splintered and sank, and so did I, in bloody terror. No, I did not jump. I let go. I surrendered. I fell. In a fast, eternal moment I despaired and plummeted. Some people think that we shouldn’t be bringing our needs and problems to God—it’s too selfish and God already knows what we need. But when Jesus taught us to pray, He said, “Give us this day our daily bread.” Jesus wants us to bring our daily needs and concerns to our Heavenly Father. This is prayer at its most simple and basic. We come as children to our loving Father and share with Him our needs and concerns, trusting that He listens, cares, and will help us. 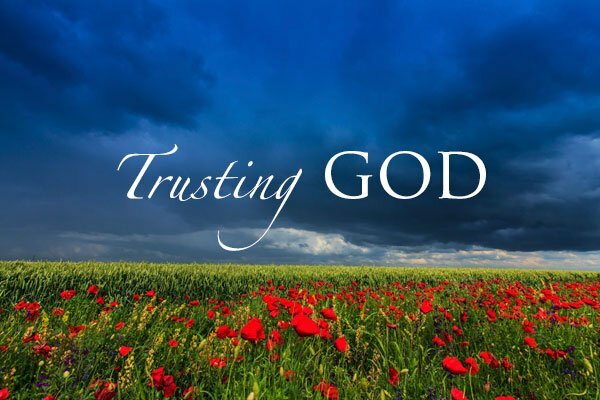 God asks us to jump into His arms, and when we pray, we are letting go of everything we think will help and simply trusting in the strong arms of our God to catch us. So let’s pray in this new year! Pray, pray, pray! This is the way we trust in the Lord.